Studio One at Chunky Move headquarters in Southbank has been converted into a 21st century videodrome: a place where real life and screen life merge, with elements of the techno-surreal. In the centre of the room a large white panel obscures our view of half the stage space and a flat screen monitor off to the side. Stephen Phillips stands in front of the panel, staring intently into a small video camera on a tripod. A live feed from the camera is displayed on the television screen. A few lights flicker and we hear the crepitations of an old vinyl record playing out its groove at the end of a side—a signal that something needs to be flipped. A lurid flash, like green lightning, reveals Lauren Langlois standing in the shadows directly behind Phillips, ghosting his slow movements, hidden from the camera. Then she’s gone again. It’s a spooky scene, artfully composed. 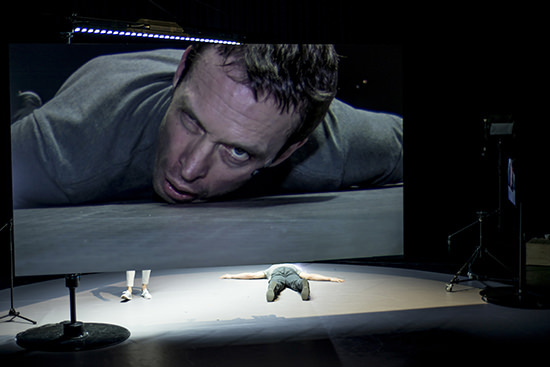 Phillips, an actor who worked with Anouk van Dijk on Complexity of Belonging (2014), moves to the other side of the stage. Now he stands watching the television. Langlois begins to rotate her upper body in large circles over her hips, long hair flaring toward the camera. He follows, imitating her screen image. What does the camera reveal? And what is hidden from the camera, outside of the frame or in the shadows? The action moves behind the large panel. 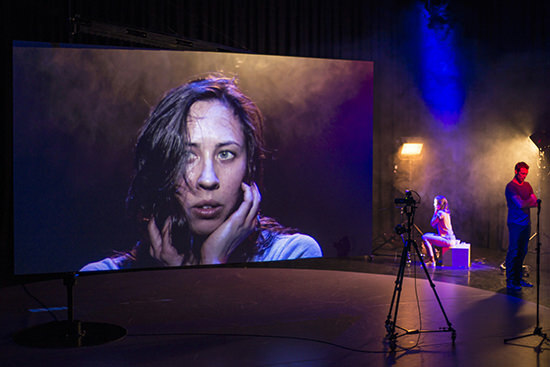 Five cameras, some fixed, some directed by the performers, bring us close-ups and partial views projected in impressive high-definition onto the white panel. We see part of a face resting on the ground, or fingers drumming and dragging, chipped black nail polish glinting under the portable studio lights. Feet or arms appear briefly from behind the screen, and we try to reconcile this glimpse of the real with what the cameras show us. Throughout, Lucid teases at the edge between screen space and real space, with the performers constantly slipping from one side to the other. With Ben Cobham’s atmospheric lighting and Jethro Woodward’s nervy sound design, it’s not so much an exploration as a mystification. Lucid revels in the glamour of the camera’s incomplete transformations; and our relationship with screens becomes a kind of dark romance. In one scene, Langlois, partially visible behind the screen, vogues for the camera, smoking a cigarette with exaggerated sensuality; meanwhile, in front of the screen, Phillips plays the role of Hollywood casting agent. “She’s hiding a secret,” he says, wistfully. “She’s hiding a secret but it’s not in her eyes.” He’s looking at the TV, which has been turned away from us. Is he looking at the same image of Langlois as we are, or at a different fantasy woman? As in a dream, one episode flows easily into the next. It’s as if the world behind the screen were an unconscious mind, a churn of desires and fears. Langlois and Phillips act out scenes from Oliver Stone’s film Platoon (1986) and discuss what it felt like, as a teenager, to see Charlie Sheen inhaling blowback through a gun barrel. Then there are a few lines of an Anne Sexton poem, a fragment of a Greek tragedy and an impersonation of Kayako from the Japanese-American horror trilogy The Grudge. And much more. Formative influences jostle in what seems like a psychoanalytical duet. And the projected visions that the audience sees? Are these the unreliable insights of a lucid dreamer? 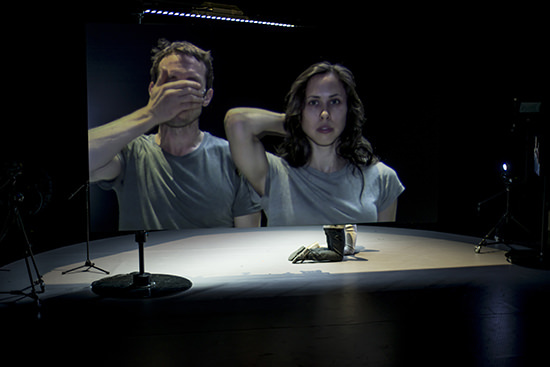 Lucid seems less a work of high-concept contemporary dance than physical theatre with a digital twist. There’s plenty of energetic rushing around as Langlois and Phillips—both wearing nondescript grey—organise the cameras, screens, lights and various props. There is very little dance, and yet the movement is constant, a restless cavalcade of scenes. There are some interesting similarities in the way that screens and live camera feeds are used in both Lucid and in director Eamon Flack’s Belvoir production of The Glass Menagerie, which, by coincidence, is playing simultaneously next door at the Malthouse Theatre. In both, the screen works like a mechanism of fascination, amplifying our uncertainties about the real and unreal, the material and immaterial, stirring vague passions and deflecting critical reflection. Compare this with the much edgier, more disconcerting ways in which, say, Benedict Andrews or Atlanta Eke use screens. Although it looks very slick, there is nonetheless something a little vulgar about Lucid. But there are some beautiful stage images, particularly in the use of the large central panel which is attached to the floor at one end like a giant flag and can be rotated in a full circle. In the last moments of Lucid, Phillips and Langlois push this panel around and around and around, a vast sweeping motion, scattering the dream material. And then suddenly the performers are gone, disappearing into the shadows. All that is left is the spinning screen, slowing to stillness.